A Latitude 41 Wedding conjures the feeling that comes with the sight of a long line of the horizon out over the sea or the spread of a shoreline. Latitude 41 is a venue located in Mystic, Connecticut. The venue was named “latitude” based in both a location and in a state of being. The building stands as a symbol of finding one’s place in the world, one’s own path amongst all the other degrees and directions that cross over, near and through people every single day. A Latitude 41 Wedding is a celebration where connections are made, memories begin, and where great food meets great people. With this in mind, Latitude is the perfect place for a bride and groom to begin their future together. 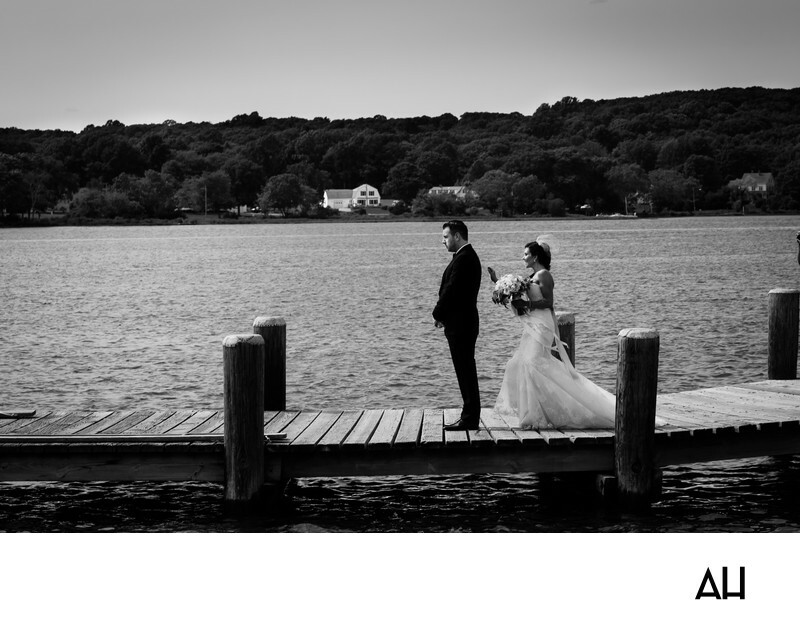 This particular couple is standing on a dock in Mystic. It is the instant before the bride and groom’s first look. This is the moment before the wedding ceremony and reception when the couple sees one another for the first time, each in their wedding attire. Many couples choose to have a first look photo as a saved memory of that magical instant when the groom turns to see his wife-to-be. In this first look portrait, the bride is grinning with excitement as she tiptoes down the dock to tap her love on the shoulder. Her gown and headpiece gently blow in the wind as tiny waves tap against the wood of the dock. The groom looks serious as he gazes ahead a the horizon, unaware that his future wife is standing right behind him. The scene is beautiful and filled with anticipation, an instant of held breath before an exhale filled with love.